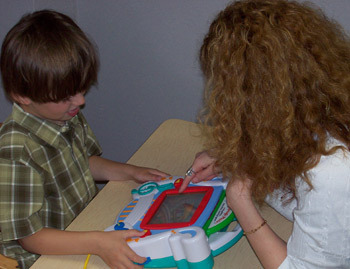 We offer a highly specialized program for children with Autism Spectrum Disorder (ASD) and related disorders. Instructional methods are based on the principles of Applied Behavior Analysis (ABA) with a special focus on Verbal Behavior Training. The program emphasizes the development of functional communication skills as well as appropriate social, play, self-help, and academic skills. With a focus on the generalization of skills, we employ both intensive teaching and natural environment teaching strategies. Highly individualized attention is given to the factors that motivate each child, thus creating a positive and fun learning environment. For children with global developmental delays we offer a specialized program that delivers one-on-one staff attention in an environment tailored to meet the unique sensory, cognitive, movement, and medical needs of each individual child. 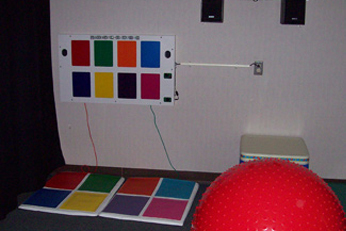 Theme oriented activities are designed to both increase visual, spatial, and auditory awareness as well as decrease tactile and/or other sensory defensiveness. This classroom actively employs a multidisciplinary approach employing the expertise and compassion of a Certified Special Education Teacher, Physical Therapists, Occupational Therapists, Speech Language Pathologists, School Psychologists, and an RN and LPN. 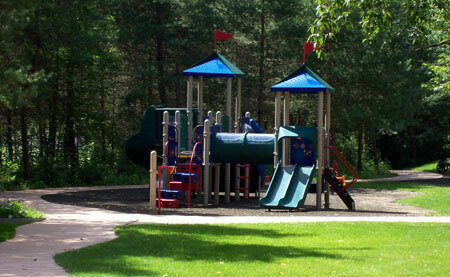 We have two Integrated Head Start Classrooms and one Early Head Start Classroom. 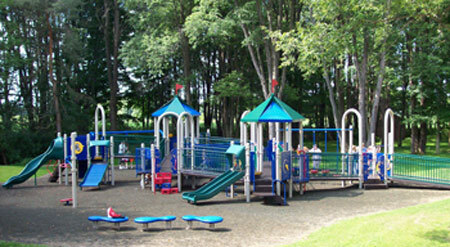 The Early Head Start Clasroom serves eight children ages 18 - 36 months. The Head Start Classroom serves 20 children each, of which there are typically eleven developing children and nine that have some identifying disability. The identified children do not have to meet Head Start eligibility criteria. Each classroom is staffed by a Certified Special Education Teacher, a Head Start Teacher, and two classroom aides. This program offers wonderful educational experiences to many of our children who are ready to transition into more typical instructional settings. EVALUATIONS - The TCL is an approved evaluation site for both Early Intervention and the Preschool (3-5 year old) population. We provide multiple-disciplinary Core Developmental Assessments as well as OT, PT, Speech/Language, Educational and Psychological Evaluations. We also provide Functional Behavioral Assessments (FBA) and diagnostic evaluations for those suspected of having Autism/Pervasive Developmental Disorders. EARLY INTERVENTION SERVICES - Provision of home- and center-based therapeutic and educational services, including Speech, OT, PT, Family Training and Special Instruction. CENTER-BASED PROGRAM - Features educational programming from two to five days a week for a 10-month school year and 6-week summer session. Therapies and services provided as needed include Special Instruction, Speech, Occupational Therapy, Physical Therapy, Vision Services, Counseling, and parental support and advocacy. AUTISM PROGRAM - Highly specialized educational and behavioral program for children with Autism Spectrum Disorders based on the principles of Applied Behavior Analysis. This program provides center-based services, home-based consultation and parent support. 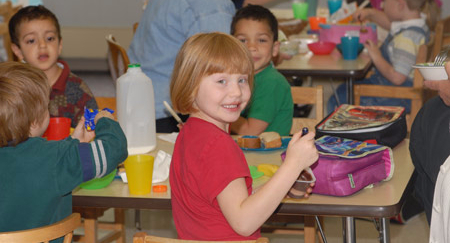 INTEGRATED HEAD START PROGRAM - We have two Integrated Classrooms that serve 20 children each. In each classroom there are 11 typically developing children and 9 that have some identified disability. The identified children do not have to meet Head Start eligibility criteria. Each classroom is staffed by a Certified Special Education Teacher, a Head Start Teacher and two classroom aides. This program offers wonderful educational experiences for many of our children who are ready to transition into more typical instructional settings. 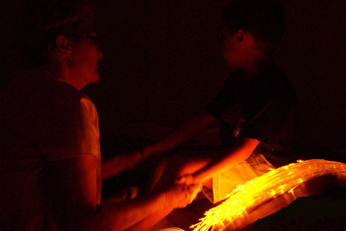 MULTIPLY DISABLED PROGRAM - For children with global developmental delays we offer a specialized program that delivers one-on-one staff attention in an environment tailored to meet the unique sensory, cognitive, movement, and medical needs of each individual child. Theme oriented activities are designed to both increase visual, spatial, and auditory awareness as well as decrease tactile and/or other sensory defensiveness. This classroom actively employs a multidisciplinary approach employing the expertise and compassion of a Certified Special Education Teacher, Physical Therapists, Occupational Therapists, Speech Language Pathologists, School Psychologists, and an RN and LPN. RELATED SERVICES - Therapy or education services including Speech, OT, PT, Counseling, Psychological Consultation, and Special Instruction as approved by the child's school district. 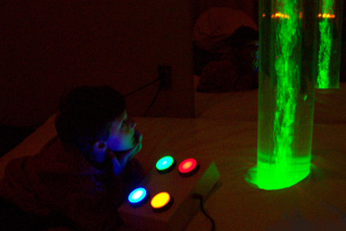 SENSORY ROOM - The TCL has a state of the art sensory room designed to calm or excite the senses (i.e., visual/tactile/auditory) using various pieces of equipment including an interactive lighted bubble tower, a vibroacoustic water bed, a vibroacoustic lighted ball bath, a vibroacoustic chaise, fiber optic light cords, an image projector, and integrated sound systems. Occupational therapists design and implement sensory integration treatment programs tailored to the unique needs of each child using the room. MUSIC CLASS - Each classroom participates once each week in a 30 minute adaptive and interactive music class that is tailored to the unique developmental needs of the participants. Dance Chimes in memory of the League's longtime attorney, Dale J. Manchester and his daughter, Janey English. 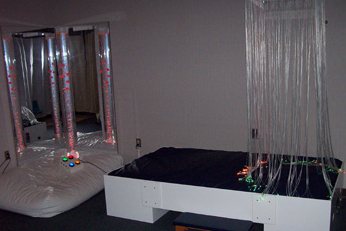 Above is an interactive bubble tower and on the right is a vibroacoustic water bed. This interactive piece of equipment is called Musical Squares. A lighted vibroacoustic ball bath. Here is the ball bath in use. 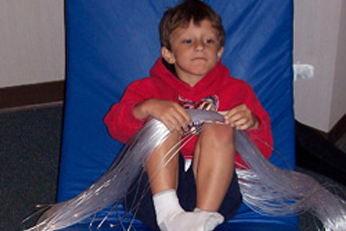 This boy is sitting on a vibroacoustic chaise with fiber optic cable on his lap and knees. 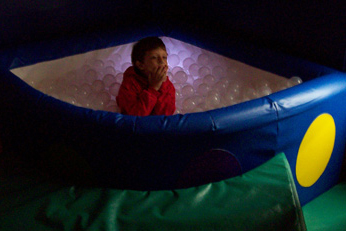 Here the child is enjoying the vibroacoustic chaise with fiber optic lights. Here is the bubble tower in use in the dark. It has multiple color settings. 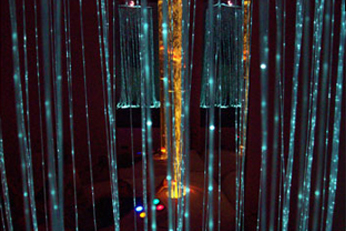 Looking at the bubble tower through the fiber optic cables over the waterbed.